Even those of us who have been paragons of responsibility for 51 weeks of the year can be tempted to take a budgeting holiday when Christmas and the summer vacation roll around. Unlike overindulging at the Christmas lunch, this has more than short-term consequences. Last December, Australians spent $25.6 billion in retail stores. A survey conducted at the time by peer-to-peer lender SocietyOne found shoppers planned to put over half the cost of the presents they bought on credit or store cards. SocietyOne’s research also found that while shoppers believed they’d pay off their festive splurge by April, most actually wouldn’t. If you don’t want to stagger into the New Year with a painful debt hangover, it’s worth taking a moment to sort your needs from your wants. 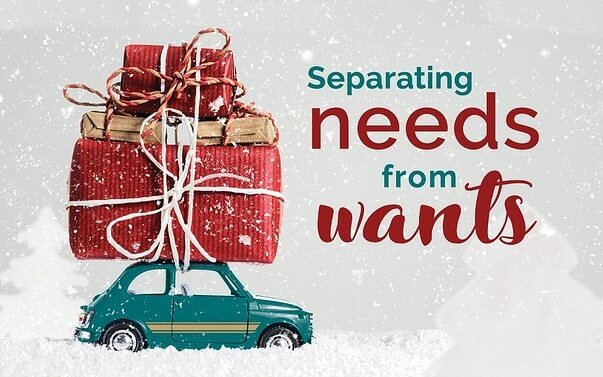 Separating wants from needs can be one of the toughest aspects of budgeting, particularly around the festive season. The line between needs and wants can be a little blurry but a good rule is to ask yourself ‘Do I absolutely need to have this?’ If the answer is no you’ve probably identified a want. You may want to serve French Champagne at your Christmas lunch but you don’t need to. Nobody’s suggesting you shouldn’t splash out at this special time of year. But your lunch guests are likely to be more than satisfied with a sparkling wine. You don’t need to spend money you don’t have on extravagant gifts and entertaining to express your love for, or try to impress, friends and family. Your wants are very much driven by emotion. We all want to shower the people we love with gifts, an abundance of festive food and other treats. However this can lead to impulse spending we did not originally plan for. Focus on the essentials and plan how much you’re going to spend before you head to the shopping mall then stick to that budget once you get there. Just because you want something but don’t need it doesn’t mean you shouldn’t buy it. Make sure you’ve got enough to cover your needs or basic day to day expenses, then with what’s left over, prioritise your wants. It’s also important to consider how you are paying for the little luxuries. Watch out for the temptation to put them on credit. The average credit card balance is $3,130 with interest being paid on $1936 of that amount. The amount of interest varies, but at a time when interest rates are at unprecedented lows, Australian credit card users typically pay 10-15 per cent interest. The interest rate for most store cards hovers around 20 per cent. Credit cards are not even necessarily the most expensive form of retail debt. If you enter into one of those ‘pay nothing for 6, 12, 18 or 36 months’ deals you’ll be looking at an interest rate of almost 30 per cent once the interest-free period ends. A more recent market entrant called Afterpay – a type of reverse layby where you get the product now and pay it off afterward – has rapidly gained traction in Australia. A big part of Afterpay’s appeal is that no interest is charged on the amount owed. But fees are levied if repayments aren’t made so it’s possible to end up paying $68 in fees on a $100 purchase. The simplest way to avoid pricey debt is to avoid spending money you don’t have. Wherever possible, limit yourself to using lay-by, cash or a debit card to cover Christmas expenses. With a bit of planning you can manage to take care of your day to day needs and still afford some luxuries of the festive season – without copping the credit card hangover in January.